In the book of Exodus the Israelites were directed to build a tabernacle in the wilderness. God gave them precise instructions for the size, materials and embroideries to be used on the draperies and priests’ garments (Exodus 25:9). 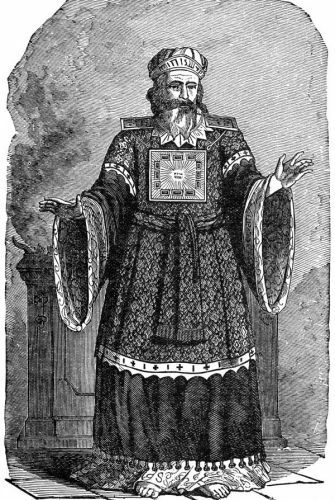 The priestly ephod was made “of gold, of blue, and of purple, of scarlet, and fine twined linen, with cunning work.” The ephod was a garment made in two parts that were clasped together at the shoulder by two onyx stones set in gold. Each of these stones was engraved with the names of the twelve tribes of Israel, six on one shoulder and six on the other (Exodus 28). When the Israelites fled into the wilderness, they may have fashioned looms from available wood, or they may have brought their looms and implements with them. Whatever they did, it seems they were able to spin yarn, weave and embroider with a great deal of skill. Embroidery is mentioned in the blessings bestowed on ancient Israelites when they agreed to keep His commandments. God made a covenant with Israel and lavished them with beautiful garments of embroidered linen and silk. These fine embroidered garments were an extra blessing given by God to make life more beautiful and enjoyable (Ezekiel 16:10-13). Exodus 35:31-33 indicates that the skill in art and science is a direct gift from God. Weaving was especially the business of men in Egypt. In Exodus 35:25, we see women, “gifted artisans,” spinning yarn for the men to weave fabric. The embroideries were either woven into the fabric or added later with needle and thread. Others offered their services in fabricating the needed tapestries which the Israelite women probably learned as bond slaves, in the houses of Egyptian princes (Exodus 35:29). Where did the dyes come from to make these colorful embroideries? Historically, the color purple has been associated with royalty. Purple dyes were rare and expensive and only the rich had access to them. The most expensive dyes were from Tyre and purple was the rarest. It was made by extracting the essential oils from a species of shellfish that lived on a small stretch of coast near the city-state of Tyre. Purple was so rare and so hard to make, and considered so beautiful that the Roman emperors decreed how it could be used by instituting Sumptuary Laws. The word sumptuary comes from the Latin word which means expenditure. These laws were imposed by the rulers to curb the expenditures of the people in order to maintain a specific class structure. Numbers 15:38 describes the fringes which the Jews wore upon their garments. They had a ribband dyed blue or purple to remind them to keep the commandments and be holy. Many forms of embroidery have developed over the centuries. Needlepoint (filling in spaces of a grid), Crewel (working thread over a blank canvas), Blackwork or Redwork (using only one color throughout the design), Drawn Threadwork (pulling threads from fabric and working a design in the space), Smocking (pleating fabric and working designs over pleats), Silk Ribbon Embroidery (using ribbon instead of thread), Cross Stitch (designs using x’s). Over the years embroidery has continued to appeal to artisans in all social levels. In fact, during World War II when embroidery threads were scarce, determined needle artists deconstructed old garments and draperies and painstakingly pulled threads from the discarded fabric in order to have threads to create new designs. 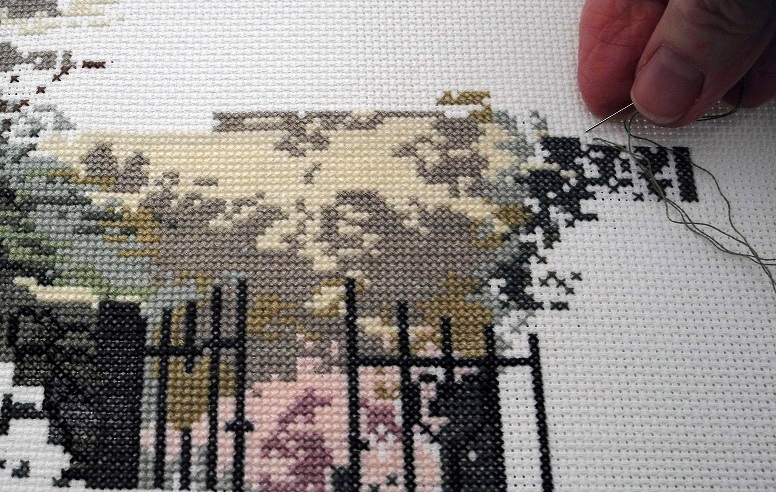 Example of Cross Stitch in progress by Judy Rand. The Internet has opened doors for anyone with an interest and a few basic supplies to partake of this craft with videos available and step-by-step instructions to guide one through each phase of the process. 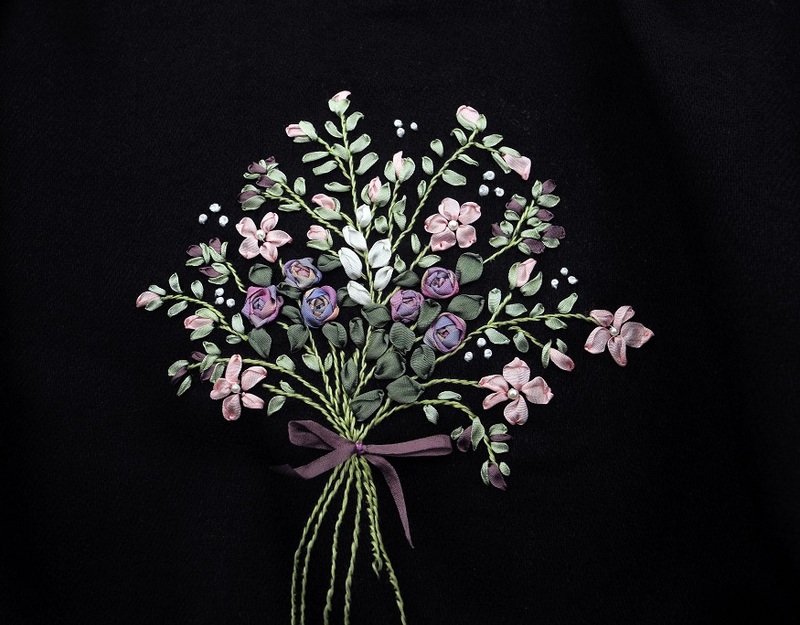 http://www.needlenthread.com/ is an excellent site for beginners and advanced embroiderers. Posted in Embroidery, Needlework, Priestly garments, Thread, Uncategorized. Bookmark the permalink. Thank you Judy for this wonderful account. I dabbled a liitle 30+ years ago. I smocked only once, a dress for my daughters first birthday. It is definately a labor of love. I admire you artistians for your craft. Thanks “digger” for your note. Hand work is so relaxing and therapeutic. I can’t go a day without picking something up for even a few minutes. What an interesting article! Thank you for sharing your beautiful work as well! Thanks, Lorinda. It’s a lot of fun. Hi Lynne, enjoyed your post so much! Thank you for the info and websites. Thanks for the interesting article with the lovely photos of your work. I appreciated the history about purple dye and the laws regulating its use. What a blessing we have so many colors available today! Thanks for your comment. We are so very blessed today. As some who has dabbled in needle art off and on since the 80’s, I so enjoyed reading this post. Not having given much, if ever any, thought to embroidery work during the Biblical time frame , I have a much deeper appreciation of it now. And…this has given me inspiration to finish a couple of needlework projects that I had laid aside! Hi Lynne. Thanks for your comment. I’m a great “Starter” but *finishing* is another story. It’s such a nice feeling to finish a project, isn’t it?